Our segment yesterday discussed the Mughal destruction of temples in Kuch Bihar, which began in the early 16th century and culminated in 1661 A.D., with Aurangzeb's takeover of the region. Throughout northern and central India, countless numbers of Hindu temples were destroyed, deities smashed, and mosques raised in their place, and this destruction had gone on long before the fall of Kuch Bihar. For 'armchair historians' looking back today, it's easy to imagine that these Muslim marauders must have hated everything Hindu, taking great pleasure in their destructive acts. While that's no doubt true, in Mughal art we also find signs that the Muslims had great appreciation for certain aspects of Vedic culture. Perhaps one of the best examples of this is found in the Razmnama. Like all invaders who intend to maintain a strong ruling presence in a new territory, the Mughals were faced with understanding the local Hindu populations, so they could most efficiently take advantage of them. One of the ways they did this was to study their most important pieces of spiritual literature – the Mahabharata and the Ramayana. 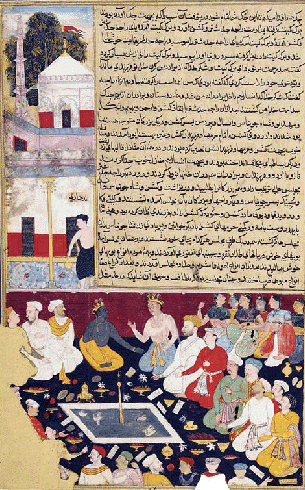 An Arabic version of the Mahabharata was first created, and later Emperor Akbar commissioned his royal artisans to produce an illustrated edition, called the Razmnama (the Book of War), which was Akbar's name for the Mahabharata. Various Arabic and Persian translations and adaptations of Mahabharata were described in a Sun Feature last year, when we ran an excerpt from Mother India by author Pradip Bhattacharya. As Bhattacharya described it, the Razmnama was not an exact translation but rather a free Persian adaptation of Mahabharata. The Muslim scholar Badaoni, who began a translation, took great offense to certain passages he found in Mahabharata, which disturbed his Muslim sentiments, thus he only translated two of the parvas. In fact, he made many disparaging remarks about certain descriptions found in the Mahabharata, and he was justly rewarded by the emperor, who in turn disparaged his translations as being negatively skewed. Badaoni's response to the criticism was to suggest that all translators of such literature are destined for hell. The fact that Akbar suspected him of infusing his translation work with bigoted ideas, and made the translator rigorously defend his scholarly efforts, is an interesting example of the degree to which Akbar himself appreciated this jewel of Vedic literature. 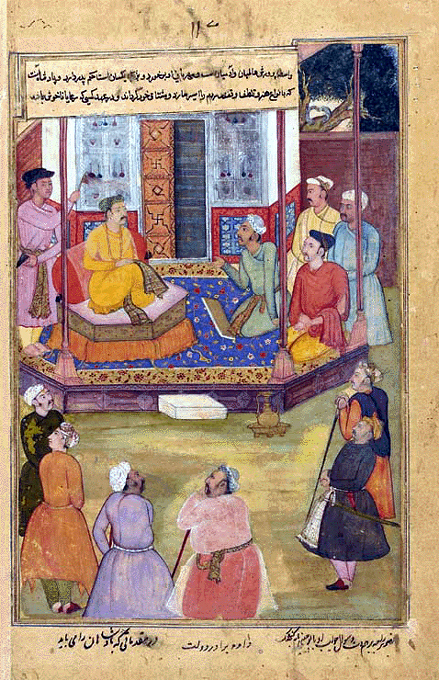 The illustrated version of Razmnama produced for Akbar is comprised of three volumes with 629 folios, which include 84 full-size miniatures by his court artists. 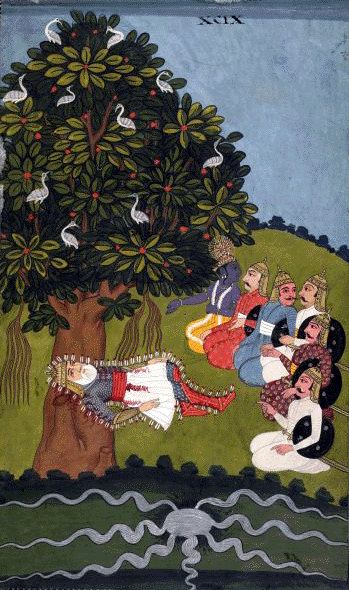 The completed work was dated 1605 A.D., the year of Akbar's death. At least one additional illustrated manuscript was produced, similar but with some additional images, perhaps as a gift for a prince or consort of Akbar's. Many of the same artists worked on both manuscripts. One can see by studying the miniature paintings which illustrate Razmnama that Akbar's painters expressed a great deal of artistic respect for the scenes from Mahabharata, which are rendered beautifully. The transcendental personalities depicted in the paintings, from Krsna and Balarama to the Pandavas, Dhritarashtra and Narada were painstakingly rendered, and can even be seen as rich in devotional sentiment. 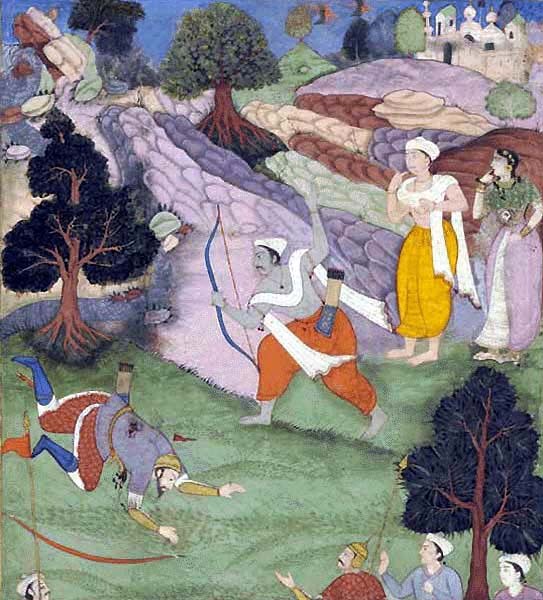 It is this fact that we find most interesting about the Razmnama -- that the very same Mughal invaders who went about destroying the temples and deities of India were also moved to depict the characters of Mahabharata in such a refined way. To what degree this can be ascribed to the non-political sentiments of the painters, or to the directions Akbar himself gave to his court artists, we don't know. But we can assume that they were all affected by the transcendental potency of Sri Vedavyasa's literary creation and the divine personalities whose pastimes were described therein.